San Francisco-based startup AstroReality is putting the AR in lunar with a high-detailed model of the moon that comes to life through an accompanying augmented reality mobile app. The LUNAR Pro has already surpassed its listed flexible goal of $36,000 on IndieGoGo. With two weeks remaining in the campaign, the company is also at the door step of its stated target of $50,000 needed to begin mass production. Using data from NASA's Lunar Reconnaissance Orbiter (LRO), the LUNAR Pro team created a precisely-measured mold, 3D-printed at 4000 dpi resolution. The model is cast from poly resin and then hand-painted. The softball-sized model is 1:28,969,000 scale and weights 1300 grams. 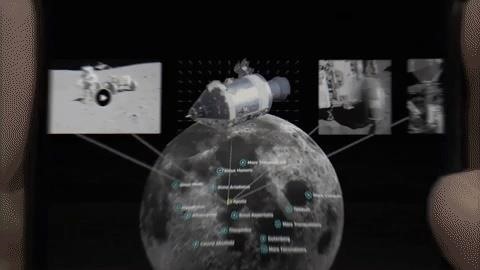 The corresponding mobile app enables users to access augmented reality content about the moon's various features, including trivia, photos, and video. "Our imaginations have forever run wild about space and now AR allows us to understand and experience it in greater detail," said James Li, AstroReality's co-founder and product design director, in a news release. "When paired with its dedicated iOS or Android app the LUNAR Pro allows users to learn captivating facts, simulate moon missions and embark on personalized space exploration from the home or classroom."